Ioannes Caldwell Calhoun (natus die 18 Martii 1782 Calhoun Mills apud Abbeville Carolina Meridionalis – mortuus est Vasingtoniae die 31 Martii 1850), alumnus Collegii Yalensis, politicus et senator, fuit etiam ab anno 1825 usque ad annum 1832, Ioannem Quintium Adams et Andrea Jackson praesidentibus, septimus Praeses Vicarius Civitatum Foederatarum Americae. Calhoun in Camera Repraesentantium Civitatum Foederatarum etiam munere populi sexti Districti Carolinae Meridionalis functus est. Calhoun, John C. Ed. Ross M. Lence, Union and Liberty: The Political Philosophy of John C. Calhoun, 1992. ISBN 0-86597-102-1. Marmor, Theodore R. 1988. 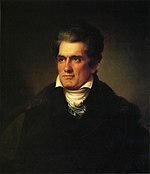 The career of John C. Calhoun: Politician, Social Critic, Political Philosopher. Novi Eboraci: Garland. ISBN 0-8240-5138-6. Niven, John. 1993. John C. Calhoun and the Prize of Union: A Biography. Baton Rouge, La. : Louisiana State Univ. Press. ISBN 0-8071-1858-3. Vicimedia Communia plura habent quae ad Ioannem Caldwell spectant. Novissima mutatio die 11 Iunii 2015 hora 19:04 facta.